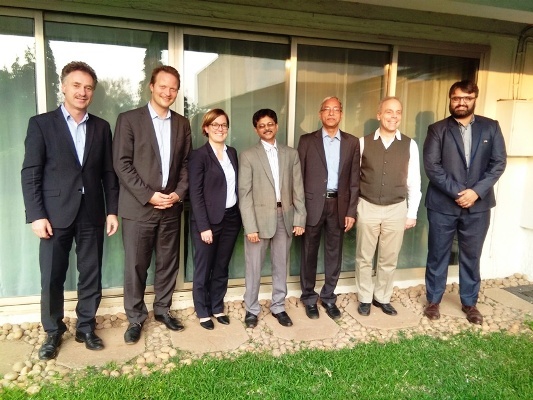 The Solar Thermal Federation of India (STFI) and the Indo-German Chamber of Commerce (IGCC) have teamed up for the international Solar Payback project, which aims to increase the use of solar thermal energy in industrial processes. The photo shows the partners during the Kick-Off Meeting in Mumbai, India, on 16 December 2016. Supported by the German Federal Environment Ministry funded by the International Climate Initiative (IKI), the three-year project will be implemented in India, South Africa, Mexico and Brazil. It is coordinated by the German Solar Association BSW-Solar and eleven partner organisations: three German companies, plus each target country’s national solar industry association and German chamber of commerce. Facilitators from Germany include research institute Fraunhofer ISE, the German Investment and Development Corporation (DEG) and communications and market research agency solrico. The project will be jointly implemented in India by Pune-based STFI and IGCC with its head office in Mumbai. It was launched in October 2016 and will end in September 2019. The budget for the four countries is EUR 2.96 million. The use of solar heat for cleaning, steam production, bath heating and surface treatment in manufacturing is still a niche market in India and around the world. “With Solar Payback, we aim to raise awareness about the huge market potential of solar process heat for three reasons: to reduce CO2 emissions, to save energy costs for the investors and to sharpen the competitive edge of local industries,” said Jörg Mayer, Managing Director of BSW-Solar.